Helping others shine isn’t new to Koch Corporation. New Construction, installing specialized new materials…”New” is something Koch Corporation has a time-tested history with. That’s why Bardstown Bourbon and Koch Corporation have been a great combination! The innovative approach Bardstown Bourbon as taken to the production of an iconic beverage like bourbon, which Kentucky is well known for, is bringing something “New” to something proven. Most bourbon production is done in a historically significant location which matches the brand. But Bardstown Bourbon has constructed a plant capable of producing bourbon to the specifications of the customer. This innovative approach has their plant completely sold-out, and they’ve hardly had time to open their doors! In fact, they are now almost doubling their capacity, and Koch Corporation has been with them through all of this growth! 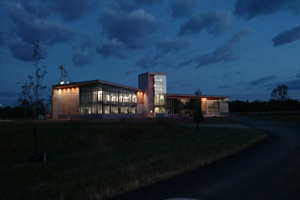 The 81 years of time tested experience Koch has in the glass and glazing industry has helped Bardstown Bourbon show off the excellence that is going on inside their new building; in fact, when you see the beautiful, newly-constructed building at night, you might even say it shines!